Madsen starts the Big Game with Big Game Motorsports | Talking Speedway, Speedway news from around the world! 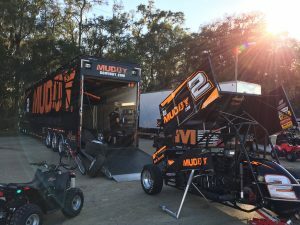 Kerry Madsen’s 2017 US Campaign kicks off this week end down Florida way at Bubba Raceway Park where he will take command of the Big Game Motorsports/Go Muddy #2 and takes up the challenge in the Arctic Cat All Stars Circuit of Champions. New Team, New Livery and colors Madsen is perfectly placed to continue his stunning Bubba Raceway form .Madsen has won his last four start at the Florida track in 2015.Comming off a fabulous summer racing down under with back to back wins against many of the best includes Americans in the recent National Open plus the defense of his Australian Sprintcar Title at Sydney’s Valvoline Raceway. This entry was posted in Sprint Cars, The US Report by admin. Bookmark the permalink.